This year, we are participating in the 99 Names of Allah Challenge countdown to Ramadan which starts in early May this year. 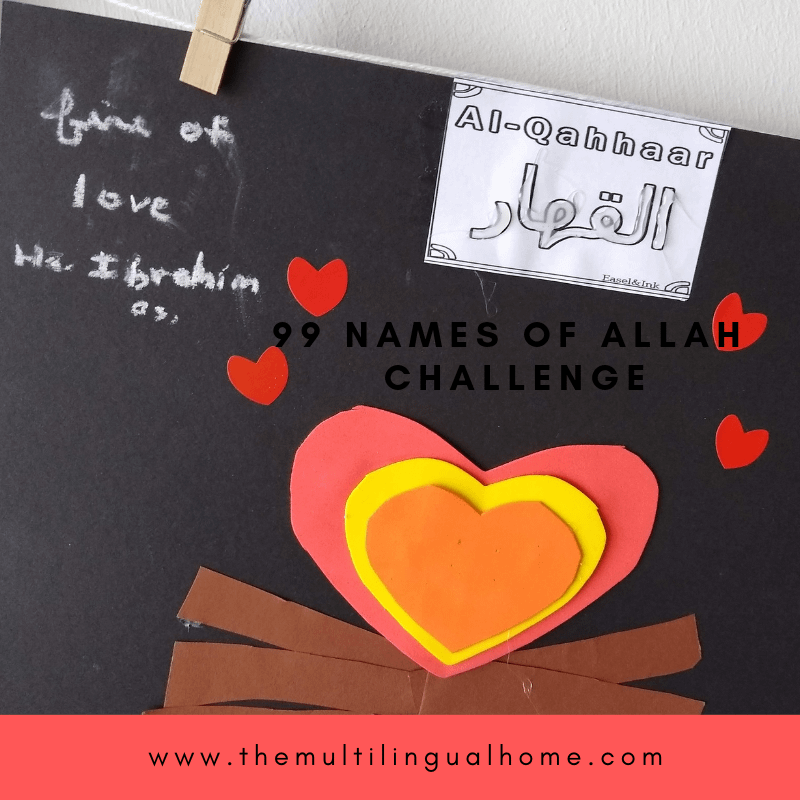 The 99 Names of Allah Challenge means we are learning one name of Allah (God) a day. 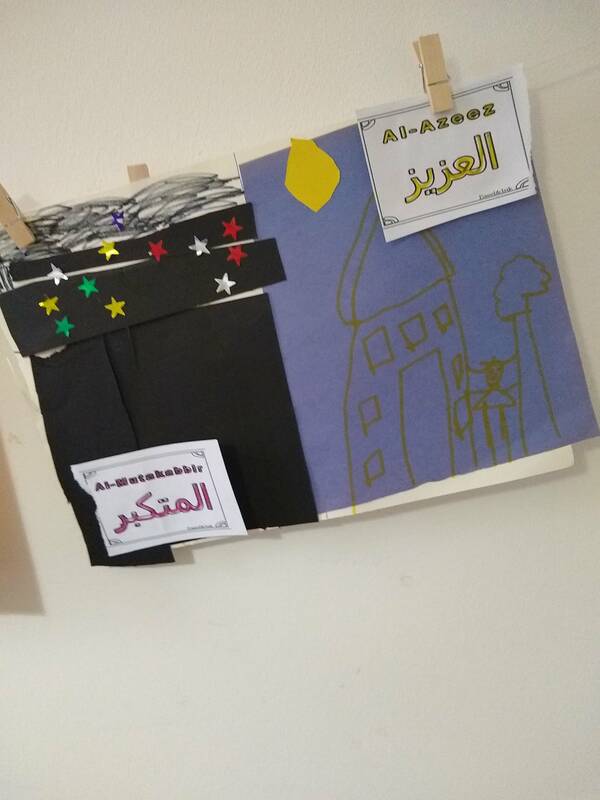 We started the challenge last week and today I will be showing our crafts and artwork from Al Muhaymin to Ar-Razzaq. This name means the Guardian. We talked about the story of Prophet Musa when he was a baby and how his mother had to throw him in the river so that he would be saved. We then talked about how Asiya found him and she became his guardian. Al Aziz means the Mighty and Al-Mutakkabir means the Supreme. We talked about the night becoming day and the day becoming night. This then led to a conversation about the moon and the sun. 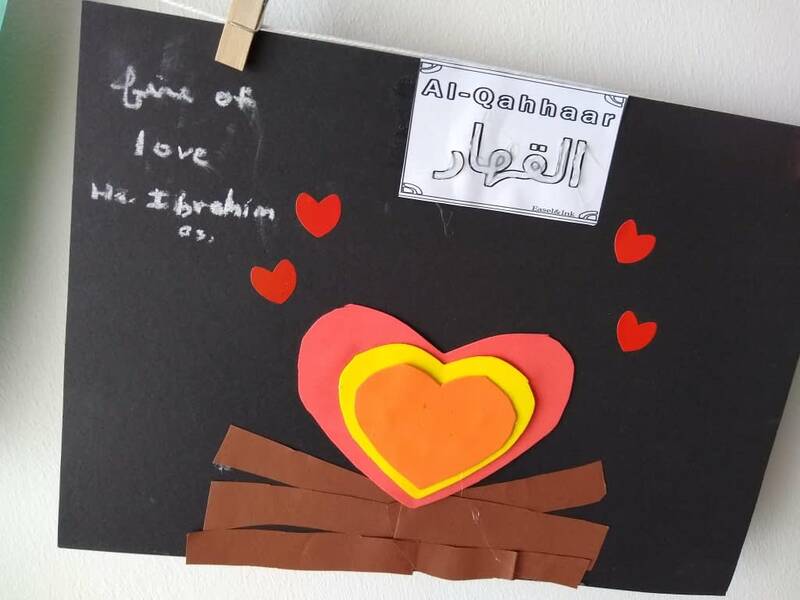 Al-Khaliq is the Creator, so we made this craft extra special. 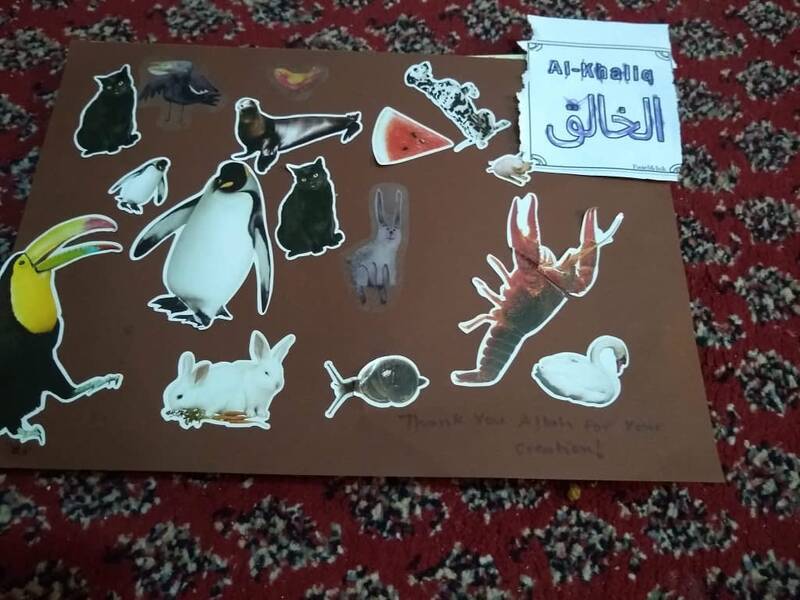 I invited the kids to pick a sticker of mostly nature items and put it on the cardboard. When we were done, we wrote a message to Allah thanking him for His creation. We also discussed the differences between things Allah has made and man made. Al Bari is the Evolver and Al-Muazwwir is the Shaper. 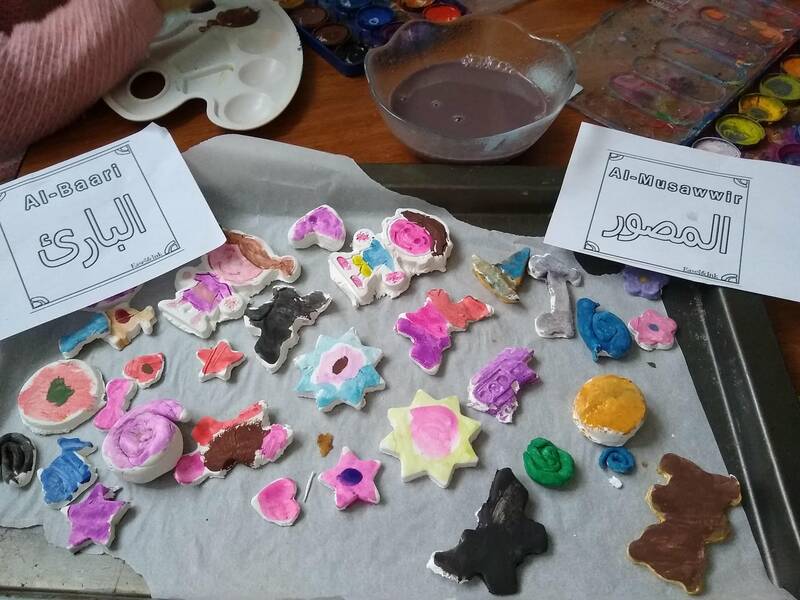 So we continued on with the idea of Allah creating everything and we decided to get out the molding clay. I do not have a picture of this one. Mr. Z brought his picture to school for show and tell before I was able to get a picture of it. But we hand painted our hands and included a dua asking Allah for forgiveness when we do wrong. We recalled the story of Prophet Adam (as) and Eve when they ate the fruit from the tree. 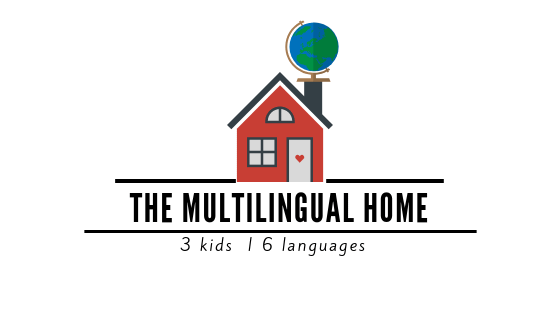 This name means the Irrestible, meaning that if life isn’t going the way we planned, God knows best. This name reminded us of the story of Prophet Ibrahim (as) being thrown into a fire after he had destroyed the temple of the disbelievers. The fire looked very hot on the outside and the disbelievers were shocked when Prophet Ibrahim (as) came out alive. God had made the fire cool for him. Al-Wahhab means Giver of Gifts and Ar-Razzaq means the Provider. 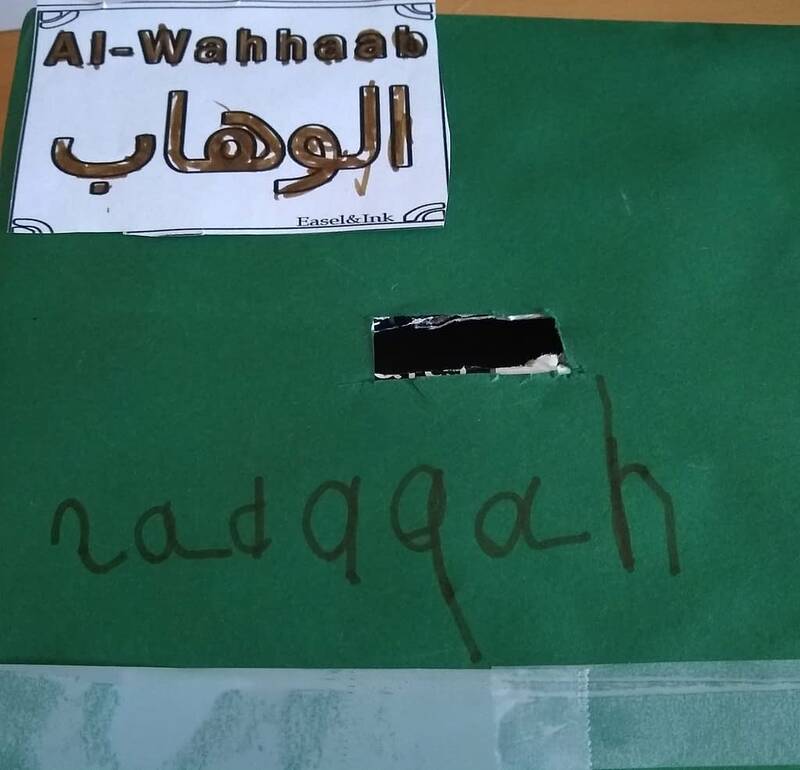 The first thing, we thought of when we heard the translations of these names was to make a sadaqah box. The example of those who spend their wealth in the way of Allah is like a seed which grows seven spikes, in each spike is a hundred grains. Allah multiplies His reward for whom He wills, for Allah is vast and knowing. 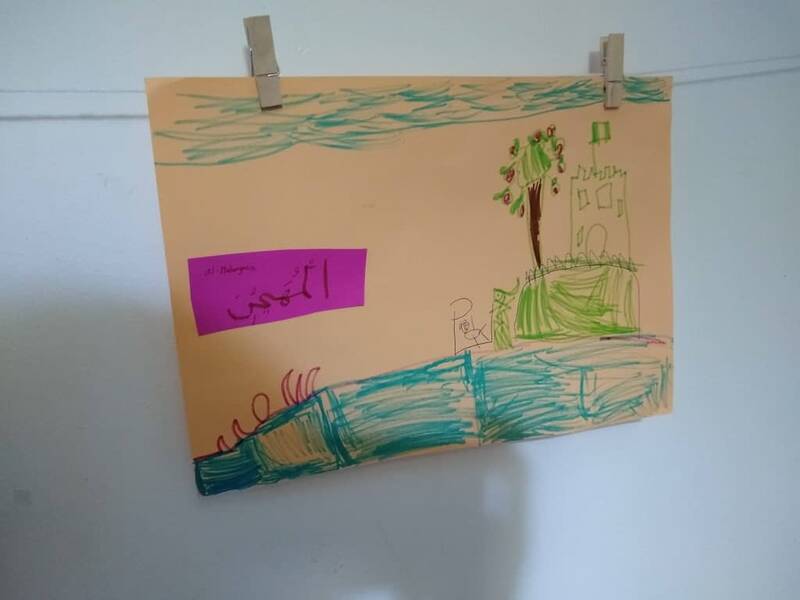 We also made a picture of Allah providing rain to the flowers.